The Student Services Building defines the last edge of a major campus lawn, acting as a gateway for students and visitors. The building houses various offices, gathering spaces, and study lounges in a “one-stop” location for students to access programs and services. The building’s design acknowledges the rainy environment of Hilo and redirects the existing network of covered walkways through the building, connecting the campus student center and library with the historic university theater. The northern side of the building is transparent to maximize daylighting and to provide visual accessibility, while the south façade facing afternoon sun and the main parking lot is more opaque, featuring smaller openings and sun shading devices. 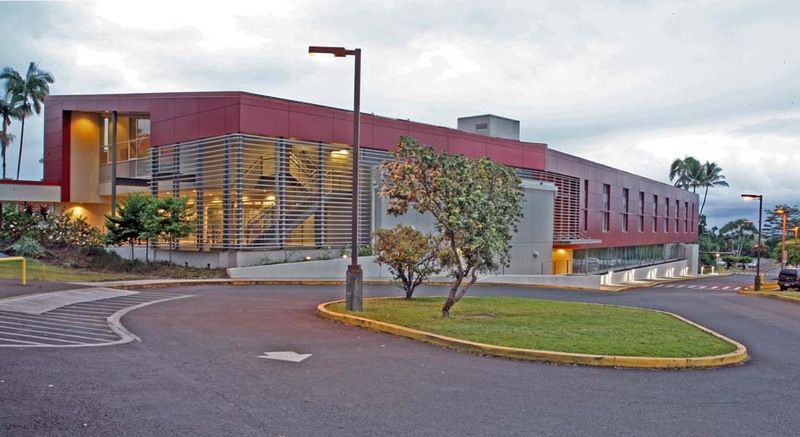 The building is linear and is harmonious with the scale of adjacent buildings; its metal roofs and wall panels are the Hilo campus’s signature red color. The project received LEED Silver certification from the USGBC in 2014.